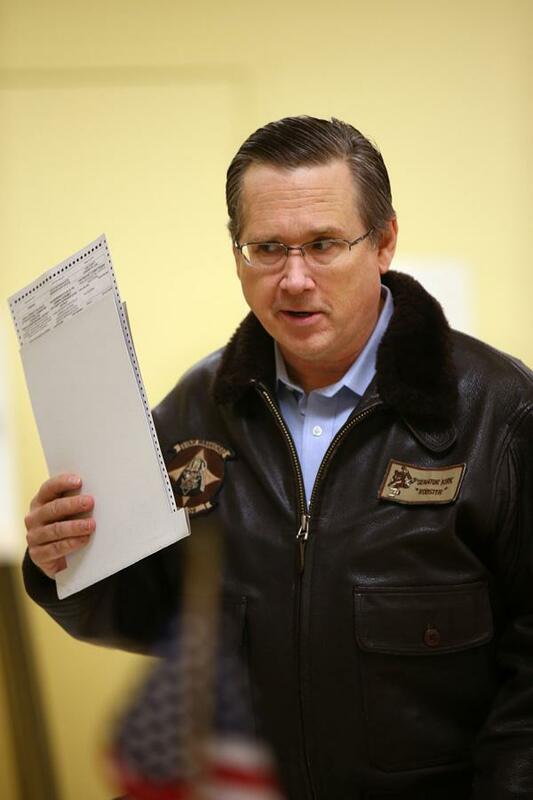 U.S. Sen Mark Kirk receives a ballot to vote Tuesday, March 15, 2016, at a Highwood, Ill., recreation center. Kirk was the first GOP senator to meet President Obama’s Supreme Court nominee. Sen. Mark Kirk (R-Ill.) met with U.S. Supreme Court nominee Merrick Garland on Tuesday, becoming the first Republican senator to sit down with the nominee amid a partisan battle over whether to seat a new justice in an election year. During the 20-minute meeting in Kirk’s office in Washington, D.C., the Republican senator criticized GOP leaders’ refusal to hold confirmation hearings or a vote on the current federal appellate court judge. Kirk and Sen. Susan Collins (R-Maine) have been the only two GOP senators to publicly state that the Senate should vote on the nominee, in opposition to Senate Majority Leader Mitch McConnell’s (R-Ky.) calls to block the nomination until the next president is elected. “By leading by example, I’m showing what a rational, responsible guy would do that really wants the constitutional process to go forward,” Kirk told reporters, according to The Associated Press. Garland is currently the chief judge of the U.S. Court of Appeals for the District of Columbia Circuit. President Barack Obama nominated Garland in March to fill the opening on the Supreme Court created after the death of Justice Antonin Scalia last month. Garland was born in Chicago and attended Niles West High School in Skokie. Kirk praised him Tuesday as “one of the most eminent jurists in the country,” The Associated Press reported. Kirk is currently in reelection battle for his U.S. Senate seat and will face Rep. Tammy Duckworth (D-Ill.) in November’s election. Kirk’s Senate seat has been characterized by many political experts as the most endangered in the country leading up to November’s election. Duckworth’s deputy campaign manager Matt McGrath said in a news release that Kirk “seems to expect extra credit by doing the bare minimum” and meeting with Garland. McConnell discussed on the Senate floor in March the seriousness of choosing the next justice. Garland is considered a centrist jurist, which could result in a major change from the conservative Scalia.